IT in higher education is often always asked to do more with less. That’s doubly true at the departmental or college level, outside of the typically better-funded centralized IT organizations. I’ve worked in both, and while today I sometimes feel like I’m asked to deliver enterprise solutions on a small business budget, in the past it seemed like we had the budget to pay for hardware and software, but not necessarily enough people to properly maintain it. Something that has become very appealing to the education market are cloud services offered either on a free or no additional cost basis. Cloud Storage is one service that sounds almost too good to be true, especially when I think about how much the giant NetApp filers we bought a few years ago cost, and how a large portion of them is used to deliver SMB file shares to users on campus with a quota of “only” 50GB. Google Apps was recently rolled out to our campus. I’m not in a position to speak the service with 100% certainty, but based on discussions we had a few years ago in central IT and on what I’ve read about concerning other colleges and universities, I figure there’s a good chance that UT isn’t paying Google anything for “Google Apps for Education.” Students can make use of nearly the full suite of apps from Google, including Gmail, whereas faculty & staff can use all of them except for Gmail. Google Drive is the service that many people were excited about having access to. White it was originally described as providing 30GB of space, Google has since announced it will provide unlimited storage to Google Apps for Education users. I’m sure this was in response to Microsoft offering 1TB of storage to OneDrive for Business users. Office 365 was recently rolled out on campus as well. Students have the option of using Office 365 for email, and over the next year, faculty and staff will do so as well. We’re also all using Lync Online now, and have access to SharePoint Online, Office Web Apps, and OneDrive for Business. Office 365 is anything but free, although I’m sure Microsoft would like for us to think of most of the services as being provided at “no additional cost.” Still, I know what we were paying for our Campus Agreement a few years back, and I know the annual cost hasn’t gone down, so while OneDrive for Business may not be broken out as a separate line item, it certainly costs the university something. OneDrive for Business originally offered education users either 25GB or 50GB, but was upgraded to 1TB a few months ago. Evidently Microsoft was not to be outdone by Google, because it too now offers unlimited storage. Whether or not a user can actually use all that space is another matter, of course. So what’s wrong with free or kinda free? I have no problem with free or pseudo-free services. I use quite a few of them every day, including Dropbox, Twitter, and more. But in the case of Google Apps for Education or Office 365, the phrase, “you get what you pay for” can be painfully true. As long as Google Drive or OneDrive for Business work well, people are happy. But the simple truth is, free services aren’t as well supported as paid services. If a user on campus loses a file on the campus T-Storage SMB file share service, both the HelpDesk and the central Systems group can and will do whatever they can to recover the file. Lose a file on Google Drive, as a user from our College of Veterinary Medicine recently did, and there may be nothing the HelpDesk can do for you. 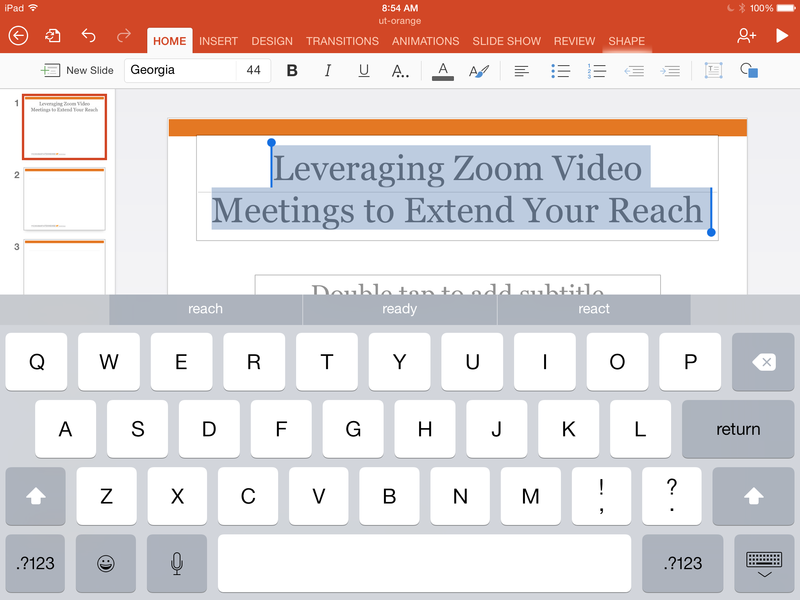 Both Google Apps and Office 365 have been described as services that are supported at a “best effort” level. In practice, that typically means helping users install or uninstall the clients, start and restart services, and perform other basic troubleshooting steps. But at the end of the day, central IT doesn’t run Google Drive or OneDrive for Business, so there is only so much they can do about it if something goes wrong. What do our users think about this? I just don’t know. I know they see these cloud services offered in official emails by IT, and they’re told to contact the HelpDesk if they have any questions or need help setting them up. I also know that if they have a serious problem with them, and they reach the limit of “best effort” support, they get really frustrated, and I don’t blame them. Those of us in IT may understand that these “free” cloud services come with lots of caveats, but I don’t expect an average user to do so. 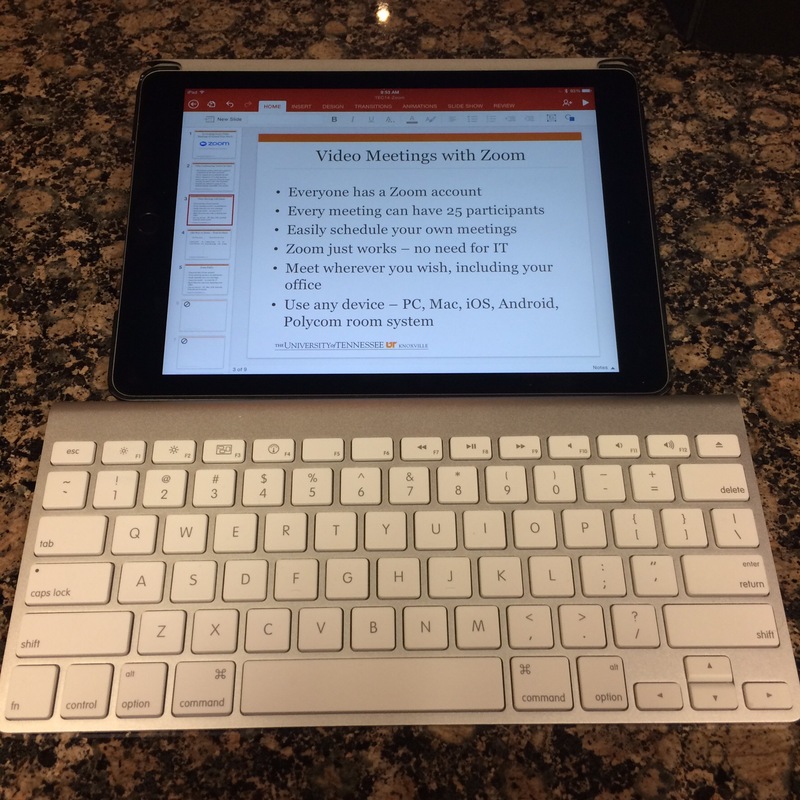 I set out this week to use my new iPad Air 2 as my only computer at a professional development conference. So for four days, with the exception of a couple of minutes tweaking a table in my PowerPoint presentation, and then using the PC to run the presentation and demo, I used my iPad full-time. At this point, I’m comfortable calling the experiment a partial success. The iPad has always been a great tool for email. Since my iPad is a personal device, I recently decided to keep my work and personal email separate. So I use Apple’s Mail app for my personal email accounts – Gmail, Google Apps, Outlook.com, and Office 365. It does a great job dealing with them, although I do wish I could mark email as spam within Apple’s app. I’ve confirmed I can do that with both the Gmail app and Google’s new Inbox app, but I’m not interested in splitting up my email across three different apps. For work email, I’ve switched to Acompli. Segregating work email into a separate app allows me to try to do a better job of maintaining work/life balance. Acompli is an interesting app, combining both email and calendar in one app, almost like Outlook. I use the calendar function sparingly, mainly because I prefer Fantastical on my iPhone and Calendars 5 on my iPad. I had no issues keeping up with email on my iPad. I actually prefer reading and answering emails on my iPad – partly because it’s easy to do quickly, and partly because it encourages me to be brief in my responses. Prior to iOS 8, the iPad was an outstanding tool for communicating with my iOS-using friends, family, and coworkers, but I had to resort to using my iPhone to send and receive text messages from folks using Android or Windows Phone. iOS 8 has changed that, as the SMS Relay functionality allows me to handle all of my messaging on the iPad. I still use my iPhone for messaging on the go or when I don’t have my iPad out, but it is really convenient and provides a superior experience. I have been pairing my Facebook presence and time down for the last few weeks. I uninstalled the client from my iPhone and don’t choose to visit the website when I’m at work. So I typically only access Facebook now from my iPad, and I do so as briefly as possible, primarily to check to see if there are any comments on the items I post into Facebook via Instagram. I don’t particularly care for Facebook anymore, but it is the only way I have to keep up with some friends and family who use it, and doing it on my iPad is the best, most contained way I have of doing it. For Twitter, I use Tweetbot of course. I’ve used all of the major Twitter clients on iOS and Tweetbot is undeniably the best, or at least my favorite. I use it on my Macs as well. I was able to monitor my feed and keep up with multiple hashtags I was following this week, both for the #vDM30in30 Blog Challenge and for my conference. Much like with iMessages, Twitter on the iPad is a superior experience. I worked on both a PowerPoint presentation and Word document this week. Both worked reasonably well, although my very strong preference is to use an external keyboard rather than the on-screen keyboard. I did have issues working with a table in PowerPoint, but I need to spend more time fiddling with it to know if that was a PowerPoint problem, an iOS problem, or simply a case where finger touch isn’t as accurate as it needs to be compared to the fine control possible with a mouse. I used Microsoft Office exclusively this week, but I have used Keynote, Pages, and Numbers quite a bit on my Mac before, and am willing to give them a shot on my iPad since they’re included with all new iOS devices now. I may need to stick to Office to ensure compatibility when sharing documents with coworkers, but most of my Office documents end up being simple enough that I will use the suite over time that works best for me. While I have recently switched to Unread on my iPhone, I’m still using Reeder on my iPad since it seems like the iPad version of Unread has not been updated for iOS 8. For simply reading my RSS feeds, I prefer doing so on my iPad over either my iPhone and Mac. I say simply reading because for feeds that either aren’t full text or that link to other sites on the web, I find Mobile Safari to be adequate for some sites, and frustrating for others. I’m not a web person, and I don’t know all the ins and outs of mobile versus desktop sites, but what I do know is that it drives me insane to hit a website on my iPad and have it force me into the mobile view. It kills me to think we moved past the whole Flash video issue years ago, but I still can’t reliably count on a website to just serve up the desktop site on my iPad, or if it does, for Mobile Safari to reliably render it. Instapaper is how I try to deal with this issue. If I see an article or blog post linked on Twitter or via RSS, I pop it open some of the time in Safari, but most of the time I send it to Instapaper, and read it there. In addition to avoiding potential rendering issues, that also allows me to skip through my Twitter feed more quickly, filing away potentially important things for later reading. While I have posted to each of my blogs this week during the conference, the experience has been suboptimal, to say the least. I used the official WordPress app to compose all of the posts, but I found the interface, especially for tagging posts, a pain to deal with. So in most cases I uploaded the post as a draft, then loaded it in the web editor, tweaked it a bit, then published. Another failing of the WordPress app involved how it handled images. While the web editor gives me options for sizing images, as well as choosing how to align them on the page, the WordPress app offered no such options. In addition to that, the WordPress app seems to only be capable of working with images from my iPad photo library, not images that I’ve already uploaded to my media library at wordpress.com. I found blogging from the iPad to be frustrating enough that I almost threw in the towel for that task and just used my PC. That would have been painful in its own way, since I use iPhoto to manage all of my photos and blog images on either my MacBook Pro or iMac at home. So if I’d tried to use my PC for the task at the conference I would have had to come up with a different workflow for taking the full quality images I’d snapped with my iPhone and save them in lower quality for the blogs. At the end of the day, I just didn’t care enough to deal with the headache, so I uploaded full quality images with the WordPress app and left them sitting on the page at whatever size it decided I was allowed to use. Even if I decide to keep using the iPad more regularly for “real computer” tasks, I won’t be using it for blogging unless I can find a blog editor for iOS that gives me all the functionality I need, as well as a photo management app for the iPad that lets me resize and reduce quality on images. If you have a recommendation for a good blog editor on iOS, please send it to me over Twitter. In the meantime, I’m evaluating Squarespace as a possible new blogging platform, as I’ve heard its mobile blog app is excellent. I got most of what I needed and wanted to get done this week using only an iPad. A few months ago, I don’t think I would have been willing to try. But it was nice carrying only my iPad, or at times the iPad and the Apple Wireless Keyboard around, instead of my laptop. I think with the right keyboard case, I could probably do just about everything I’d need to do on the go with my iPad, with one giant exception right now – writing blog posts the way I want to write them. I’m looking at keyboard case options, and I’m not ready to pull the trigger yet. Logitech makes the Ultrathin Keyboard Cover, which multiple people have recommended to me. Someone also recommended the Logitech Tablet Keyboard. I’m waiting for now until the Belkin QODE Ultimate Pro Keyboard Case for iPad Air 2 comes out before making a final decision. The other QODE’s are highly rated and the Ultimate Pro seems like just what I’m looking for – a case for the iPad when I want to be just a tablet, and a keyboard that the case attaches to when I want to use it as a semi-laptop. I’m not ready to sell my MacBook Pro and go all iPad all the time. I’m writing this blog post on my MacBook Pro as a matter of fact. But I will be using my iPad more than I ever have in the past, and for tasks I hadn’t considered it for until this week. I’ve spent the last 24 hours living almost exclusively on my new iPad Air 2. I’ll explain what I mean by almost in a bit, but for now, I can say I am satisfied that I can make it through the entire conference without using a “real” computer again, with the exception of the presentation I will be giving 55 minutes from the time that I’m typing this. I worked on my presentation today using PowerPoint. I could have used Keynote, of course, but I’ll be delivering my presentation using a PC, so I didn’t want any potential headaches with file format translation. For an hour or so, I tapped away on the on-screen keyboard, but I grew tired of that, especially since I wanted to do a long of inter-line cursor movement, so I pulled out my Apple Wireless Keyboard and increased my productivity quite a bit. Paired with a good keyboard, I’m much happier using the iPad for non-tablet tasks involving typing or selecting lots of text. That doesn’t mean everything is perfect, however. I’m not sure if this is a PowerPoint on iOS issue specifically, or an iOS problem in general, but I discovered one thing that I simply was unable to do on the iPad within PowerPoint. I could not select the column border within a table in order to modify the column width. So that’s one little thing I had to tweak on the PC just now as I prepped my file for final delivery. Something else I’m seeing after using the iPad + Apple keyboard combo is that lugging around a separate keyboard, particularly one that is exposed in my bag or even in my hand, just feels weird. So I believe I need to investigate some sort of keyboard case, particularly one that might allow me to either quickly remove the iPad for tablet-only use, or one that could accommodate the iPad in a separate tablet case. That’s all I have for now. I’ll post more about my iPad-only conference experience in a couple of days. 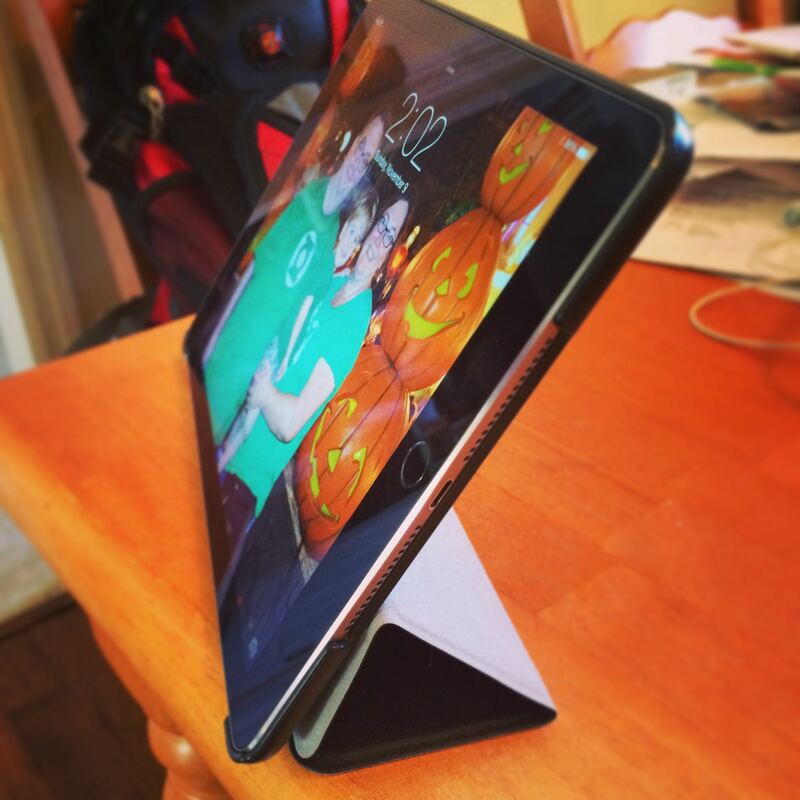 I’ve had my new iPad Air 2 for 3 days now, and I continue to be impressed with this device. After returning the overpriced Apple leather Smart Case to the Apple Store yesterday, I used it for about 8 hours total without a case at all, and was amazed at how thin and light Apple has managed to make the iPad. Still, I needed a case of some kind before leaving town for a conference, so I jumped on Amazon’s website and did a quick search. I found this case by Moko for the low price of $10.95 with free Amazon Prime shipping. It has the same trifold design as Apple’s case, but I decided it would be worth it, even if I just used it for a short period of time while researching other options. I ordered it on Friday afternoon and it arrived today on Sunday. I would say it is no worse than the Apple case, and considering it is $68 cheaper, that’s good enough for me for the time being. 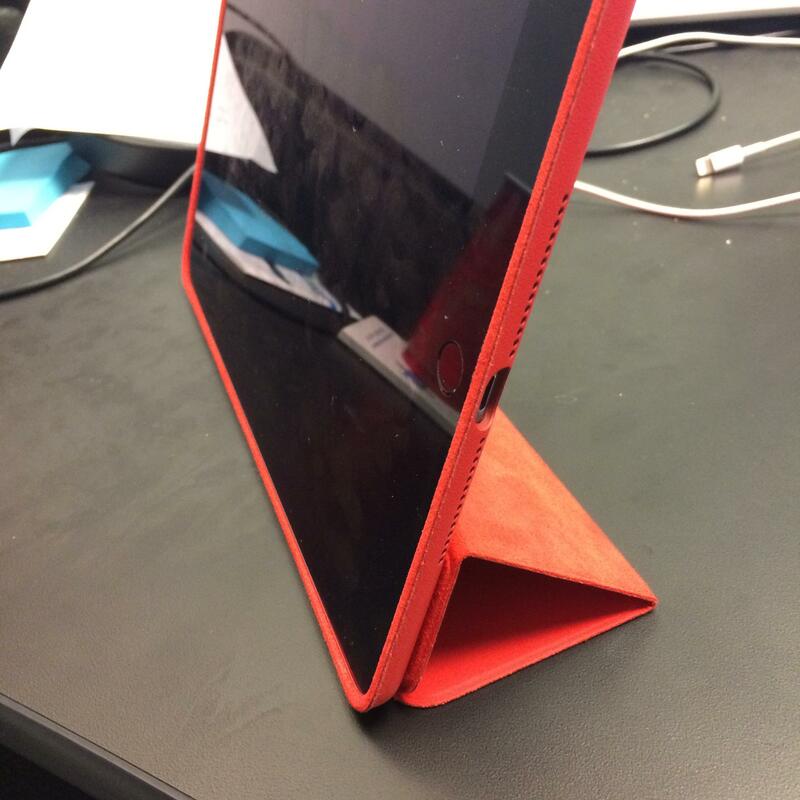 Here’s another shot of the case with the front flap folded over to be used as a stand. It may not be as good as my iPad 3/4 case, but at least as good, and possibly better than the new Air 2 Smart Case from Apple. I say better because the front flap is stiffer than the Apple case, and it didn’t require meticulous folding and refolding the first few times like the Apple case did. Still, I don’t expect much for $11, and as long as this case keeps my iPad from getting scratched in my backpack, I’ll be satisfied with it. One final shot here shows a major difference, I think for the better, between the Apple Smart Case and this much less expensive Moko case. The Moko case has a hard plastic back, and it seems to me that it should do a better job of protecting the iPad in the even that I do drop it, especially at the corners. I may be wrong, and I hope to never have a reason to find out. I’ve written about the tablet concept in general, and specifically about how the Windows tablet concept doesn’t work for me before. I haven’t had any experiences to moderate my opinion of Windows tablets, but as I continue to see others, including my wife, make use of iPads to do nearly everything they would do with a “real computer” I have to admit that I may need to reconsider my opinion, especially as it relates to the iPad. In the last couple of days, I have composed blog posts, typed long emails, edited photos, remotely connected to my office PC, and other tasks I would usually not attempt on a tablet. Partly I’m trying to get used to the thought of using a tablet full-time at an upcoming conference, and partly I’m enjoying the increased speed and functionality of this new Air 2 over my old iPad 4. When I leave for this conference tomorrow, I’ll be taking my Dell laptop to use for my presentation – not because I couldn’t deliver Powerpoint or Keynote slides with my iPad, but because I’ll be demoing Windows software during the presentation since 99% of the people attending my presentation will be using a PC at work to get their jobs done. But other than that presentation, I intend to use my iPad for all my note taking, email checking, web browsing, and Twitter during the day. In the evenings, I’ll keep using the iPad for those things and to FaceTime my wife and son back home. I’ll compose the blog posts for the 30 Day Blog Challenge on my iPad as well, although they may be somewhat media lite since the WordPress app seems to be willing to let me add local images to a blog post, but for some crazy reason won’t let me access all of the images I have already uploaded to my WordPress library. After 4 days on the road I should have a good idea if I can continue to make regular heavy use of a tablet like I see so many others doing. After waiting just over 2 weeks for my iPad Air 2 128GB Space Gray WiFi to arrive at the campus computer store, it finally arrived yesterday. I picked it up from the computer store, quickly connected to my iPhone 5S to register it and sign in, and got to work trying out my new iPad. I was excited because, while I have used every full-size iPad since the original in 2010, this is the first new iPad of my own since the original iPad. Since then, I have inherited my wife’s iPad 3, then iPad 4. I didn’t mind, especially since she took to the iPad immediately and has used it as her primary computer at home since early 2012. But last year, just before the iPad Air was released, there was an accident and the screen on the iPad 4 was shattered. So my wife got a new iPad Air and I paid $30 or so for a replacement screen on eBay and had a buddy replace the shattered one for me. It’s worked fine since then, but about a month ago it started exhibiting touch screen glitches, which prompted me to go decide to replace it. With Apple’s recent move to increase the storage capacity on iPhones and iPads from 16/32/64 to 16/64/128, and especially since this iPad should get handed down to our son once I’m done with it, I decided to max out the storage. Education pricing only cuts $20 off retail price, so I paid $679 plus tax for mine, along with $99 for Applecare+. 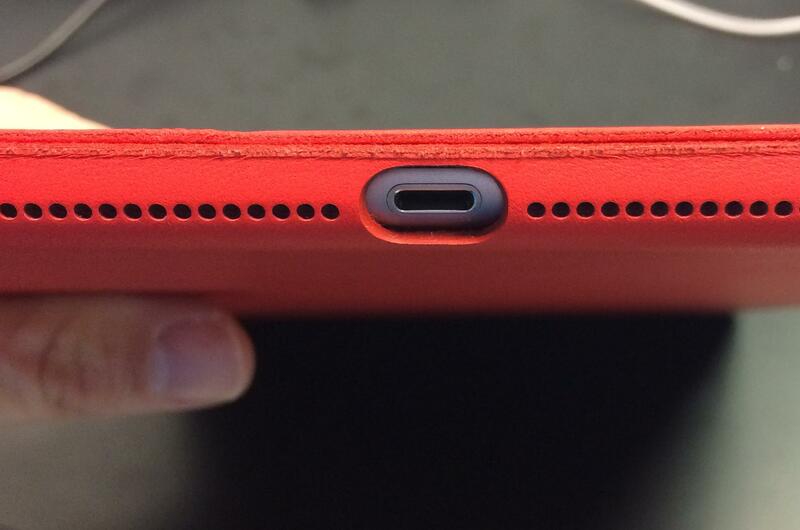 The iPad Air 2 seems very thin and light to me as a regular use of an iPad 4. The iPad 4 isn’t heavy by any means, but picking it up and holding it by the corner in one hand requires a bit of effort, whereas doing the same thing with the Air 2 does not. I can’t speak to how much thinner or lighter it feels than the Air, as my wife keeps it in a Dodocase Folio that I got her for Christmas last year. That case was very expensive, almost $150, but the craftsmanship and quality is pretty impressive. I don’t like thick cases like the one my wife uses. She carries her iPad everywhere and is more concerned about dropping hers than I am. She also uses her iPad much more as a portable computer than I have in the past. 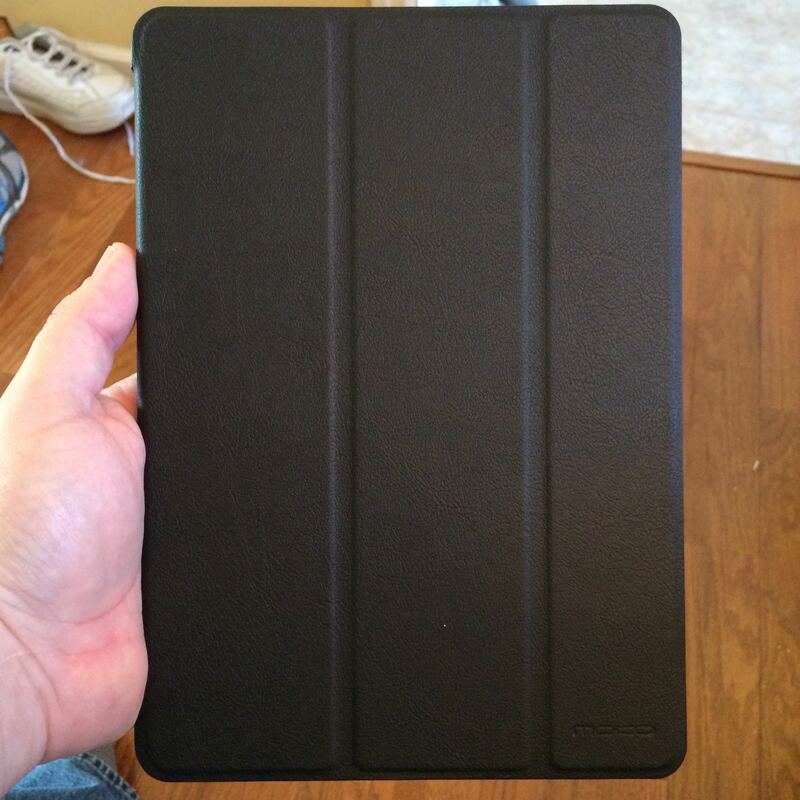 So last night I stopped by the Apple Store and purchased the Apple Smart Case for the iPad Air 2. 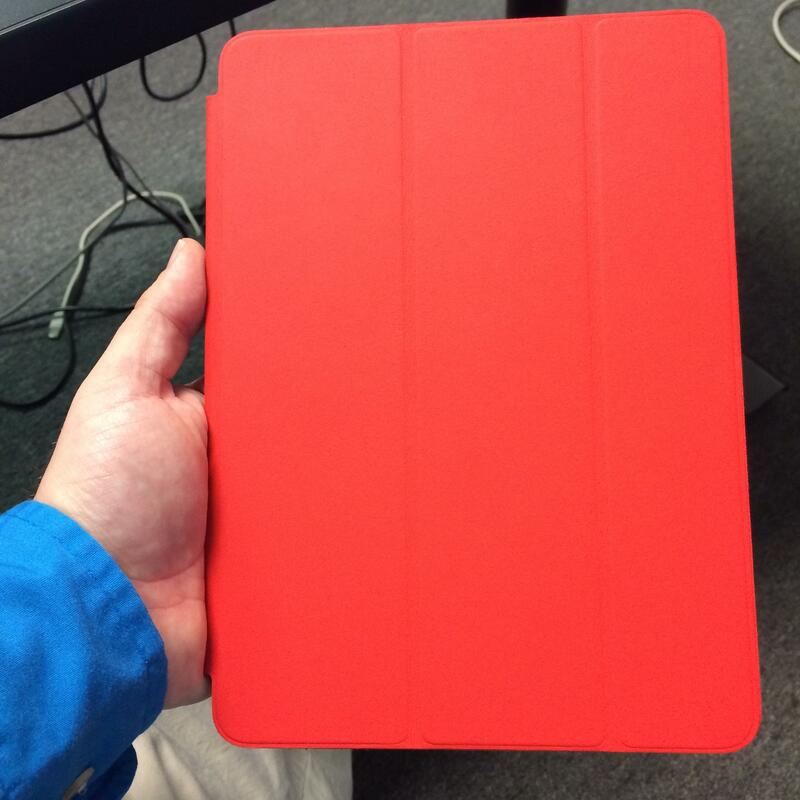 I had the polyurethane Smart Case for the iPad 3/4 and liked it just fine. I see it costs $49 now, but I’m certain I paid $39 for mine. I wish they offered the same type of case for the Air 2, because $79 for the leather one is ridiculous, but it was the only case made specifically for the Air 2 in stock at the Apple Store. I went to bed last night believing I would likely return the Smart Case after researching and finding a better, or at least less expensive option. After using it for a couple of hours today, I’m certain I’ll be returning it. I liked the 3/4 style case. It had 4 folds in the cover, and was quite sturdy when folded up to act as a stand. This new tri-fold cover is much less sturdy, and also much trickier to fold into the triangle shape. This case is also more difficult to open. My 3/4 case, which I can use with my iPad 4 side by side this one, separates easily when I want to open it – the top just flips open. The Air 2 Smart Case, either because the magnets are stronger or because the leather itself isn’t as tacky, requires much more effort to open – which just exacerbates my irritation at having paid $79 plus tax for it. So I’m hoping folks who read this mini review can reach out to me over Twitter to recommend a good case for the Air 2. I’ve toyed with the idea of getting a keyboard case, and I may at some point, but for now, I have an Apple wireless keyboard, so I’d like to stick with something simple – just something to protect the back and front. You can reach me on Twitter at @mikestanley if you have suggestions. I haven’t used the iPad Air 2 long enough to make informed comments about every aspect of it. I can say it does seem significantly faster than my iPad 4, and the decreased size and weight make it easier to carry and hold. Look for a more substantial review in the near future. In fact, I’m heading out of town next week to present at a conference, and while I have to lug my Dell laptop along with me to use during my presentation and for work, I believe I’ll limit myself to using only my iPad Air 2 for taking notes during sessions, and for my own personal use in the evenings. Having covered Apple or Mac-Related podcasts in my previous post, I’m going to write a bit about my “Career” playlist in this post. At least two of these podcasts aren’t explicitly about careers, but I group them together because many of the topics discussed on them have helped me either at work or as I think about my next career move. Geek Whisperers is hosted by John Mark Troyer, Matthew Brender, and Amy Lewis and focuses on Social Media and Community in Enterprise IT. 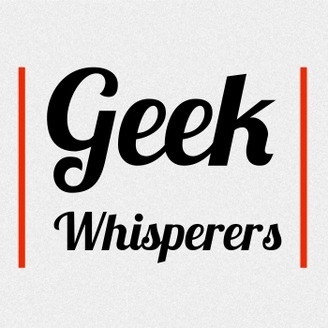 Geek Whisperers is one of my favorite podcasts, and that was true even before they had me on as a guest on Episode 57. The hosts bring a wealth of experience in both startup and large vendors, and each of them has created thriving influencer programs like the vExperts, EMC Elect, and Cisco Champions. Regular topics include the impact blogging and getting involved in communities and social media has on one’s career, good and bad ways to market to IT Professionals, community building, and just what the Hell is a Unicorn. The most recent two episodes as of this post (62 and 63) resonate especially with me because, like Matt Simmons, I’m in IT in higher education, and like Whitney Carnes, I’ve run my own IT consulting/service practice for small businesses. I’ve recommended the Geek Whisperers podcasts to everyone from my wife, a vice chancellor in marketing, and fellow geeks/unicorns. I consider this one of my two must-listen podcasts, and if I had to pick a single podcast to recommend with the highest chance of being approachable from any random episode without prior knowledge of inside jokes and jargon, it would be Geek Whisperers. I began listening to Back to Work for the productivity and work discussions, but I’ve stayed for the “more” – which includes parenting, comic books, movies, hygeine while traveling, and a never-ending stream of references to Glengarry Glen Ross. Back to Work is the sole exception to my growing dissatisfaction with long podcasts. I could listen to Merlin and Dan talk about whatever pops into their heads because I know that, chances are very good that somewhere along the way they will often make me laugh, sometimes make me cry, and more often than not, help me learn something important about myself. My recommendation – give Back to Work three episodes. If it hasn’t clicked for you in that time, it probably won’t. 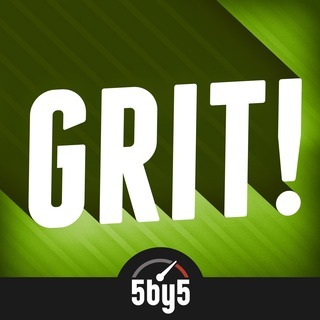 Grit is another of my favorite podcasts on the 5by5 network, and hosted by Dan Benjamin. It used to be called Quit, and I personally preferred that name, but I understand why Dan felt he had to change the name. Evidently a lot of people assumed without listening to the show that it was about quitting smoking. Others who may have listened but not really paid attention to the show thought it was all about Dan encouraging people to quit their jobs – something he actually did very rarely, and never without cautioning them to save money, make sure they had something else lined up income-wise, etc. One of the best pieces of advice Dan gives out to folks who may be thinking of “kicking their corporate stooge job to the curb” and starting their own business is to do whatever that business may be on the side on nights and weekends, with his point being that if you aren’t willing to give up your free time outside your full-time job to do [insert new business here], you likely don’t have the tenacity to do it more than full-time on your own. With the name change to Grit, Dan makes it more clear the show is about improving your career, even if that means staying at your current job, and starting something awesome – be it on your own or at your job. He takes calls from folks looking for advice, answers the occasional email, and frequently has guests on to offer their perspective on building their own businesses. I keep coming back to the idea of reviving my own IT consulting business, and virtually every episode of Quit/Grit has given me insights into doing it that I wish I’d had the last time I started, and am definitely glad I have now. 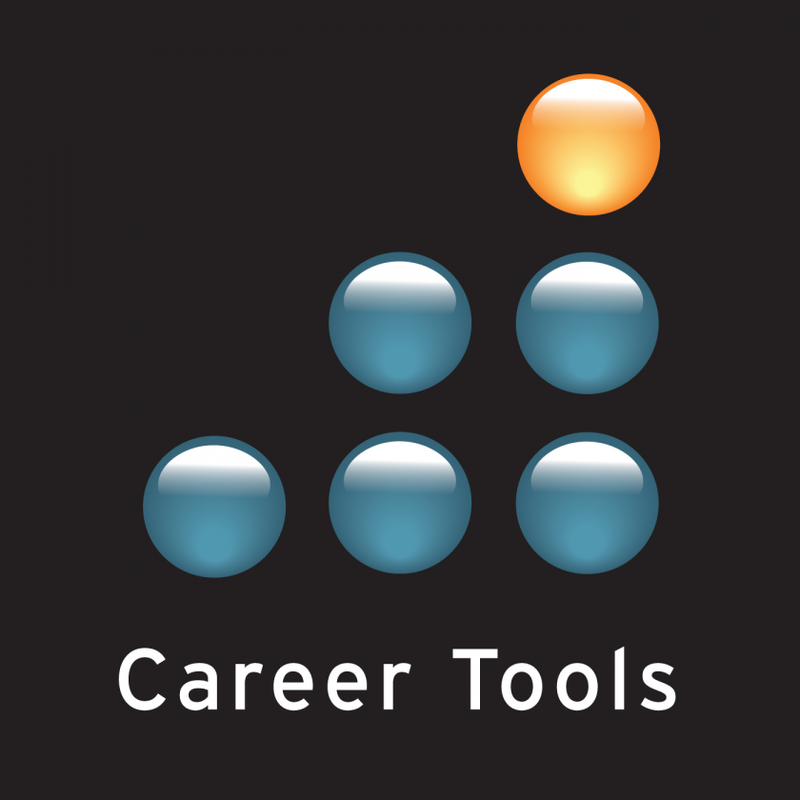 The last podcast in my Career playlist is Career Tools, a podcast hosted by Mark Horstman and Wendii Lord. I discovered Career Tools after a former manager mentioned he liked the Manager Tools podcast – a show that’s goal is to make “every manager effective.” The Career Tools goal is to make “every employee productive.” When I discovered the podcast I was preparing for a career change, and I found the Resume Workbook produced by the same folks who host the podcasts to be very helpful. These people have been recruiters and they give excellent advice not only about what your resume should look like, but how you should keep it up to date on a regular basis by maintaining a Career Management Document. They have episodes dating back over eight years and have produced series of casts on interviewing, maintaining effective work relationships, and much more. You might find some of the other podcasts on this list more fun or enjoyable that podcasts, but I’m pretty sure Career Tools could be the most broadly useful to you in advancing and managing your career. One funny story about conflicting advice I’ve received from people about my resume, which I produced following the Career Tools method – which is to stick to one page, period. I’ve had a couple of people tell me flat out that there’s no way my resume could possibly work as well as a longer, more flowery resume like theirs. At least a couple of these people don’t seem to grasp the irony that my resume landed me numerous interviews and (those interviews resulted in) several job offers, across multiple industries. I’m not a resume expert, but I’ve reviewed dozens of them on various hiring committees, and I tend to side with the people who have been recruiters in the past and who give advice that I see has worked – keep it short and to the point, and highlight accomplishments in your previous roles. I listen to a lot of podcasts. I’m currently using Overcast, an iOS app written by Marco Arment, creator of Instapaper, for nearly all my podcast listening. I listen in my car via a Bluetooth to FM transmitter because my car is old enough that the radio in it doesn’t even have an AUX input. I listen at work during the walks I try to take several times each day. I listen at other random times when I need to shift my focus away from work or anything else. I don’t watch a ton of TV these days and I’m not reading as much as I used to or would like, so I listen to podcasts. I organize the podcasts I listen to into playlists based on categories that make sense to me. In this post I’ll cover the first category – Apple or Mac-Related. Mac Power Users on the 5by5 network is a hosted by two lawyers, David Sparks and Katie Floyd. I can’t recall why I stumbled across MPU, but I know when I did, I expected to listen to a few minutes and delete the episode. Come on – listening to two lawyers talk about Mac stuff – how interesting could that be? Turns out pretty damned interesting. David and Katie cover a wide range of topics, but what keeps me tuning in is the focus on productivity, automation, Macs in education, the very interesting guests they have on from time to time, and the “Live Shows” they record each month that incorporate user feedback and tips, either read by the hosts or played in audio format. I’m struggling with my own efficiency and productivity these days, and their frequent discussions of the topic and the tools they use to tackle it, including OmniFocus, have helped me as I consider my next moves. Their recent interview with David Allen of Getting Things Done prompted me to get the book and start working through Allen’s introduction to GTD on Lynda.com. My only recurring gripe about MPU is its length. There was a time when 90+ minute podcasts didn’t bother me, but as I’ve added additional good podcasts to my playlists, I’ve become less tolerant of longer podcasts, especially when most of the time it seems to me, as a listener, that so many podcasts run to 90 minutes or longer because of a lack of focus and a desire to just keep talking. I’ve begun making regular use of the 30 second skip button in Overcast once a host starts rambling. David and Katie don’t ramble much, but I do think their shows could be tighter and more efficient at 60 minutes than 90 minutes. Speaking of podcast length, Clockwise, now on the Relay FM network, is my new favorite podcast. I discovered it a few weeks ago when the news that IDG had killed the print publication of MacWorld and laid off most of its staff. 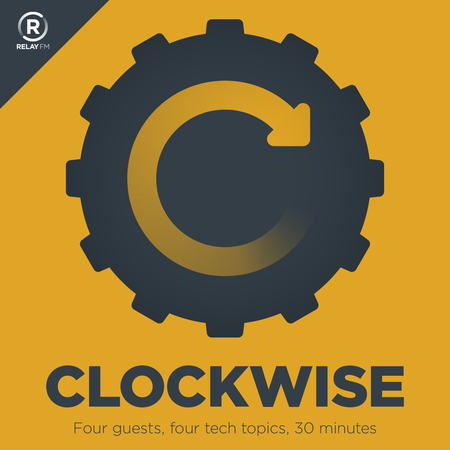 I’ve followed Jason Snell, former Editor in Chief at MacWorld and other IDG properties, for a while via other podcasts, and heard he was bringing Clockwise to Relay FM, so I gave it a listen. Jason Snell and Dan Moren host the show, and along with two guests, they discuss four topics for no more than five minutes each, and produce a show that lasts no longer than 30 minutes. As far as I’m concerned, that’s close to a perfect formula for a tech podcast. Clockwise is so good, in fact, that I’ve branched out and started listening to other Jason Snell and Relay FM podcasts, some of which I’ll list below. But it’s also increased my irritation with other podcasts that are just crazy long. And speaking of crazy long podcasts, ATP is a podcast that is as likely to be removed from my playlist as not in the near future. 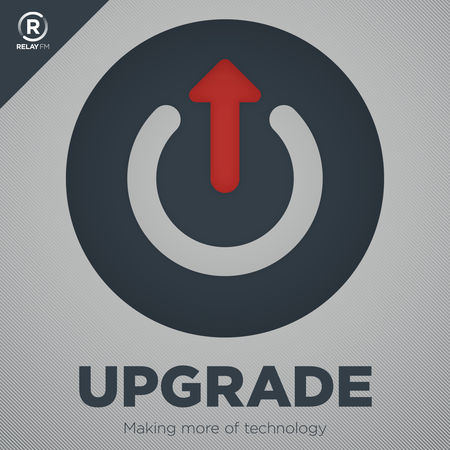 Hosted by Marco Arment, Casey Liss, and John Siracusa, ATP is a podcast I listen to primarily because I’ve listened to and really enjoyed podcasts 2 of the 3 hosts have done in the past – Build & Analyze (Arment) and Hypercritical (Siracusa). The topics they discuss tend to be Apple-focused in some way, although they touch everything from cars to video games. A recent episode had John Siracusa give one of the best rants about the whole Gamer Gate thing that I’ve heard or read – and if you’re concerned at all about the topic, you should give it a listen. 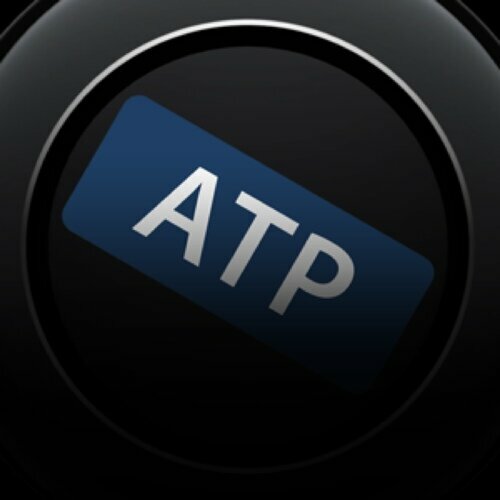 So why may I remove ATP from my queue? It’s just too long. I like hearing what these guys have to say, but at some point, I have to admit I don’t like it enough to give up almost two hours of my limited listening time to hear it every week. Once I discovered Clockwise, I basically added several other Relay FM podcasts to my list, both those featuring Jason Snell and others. I tried a few and dropped them, not because they were bad or uninteresting, but simply because I had no connection to those hosts and didn’t want what was still an unproven network in Relay FM to dominate my listening time. I’m listening to two others at this point, and I believe I’ll keep doing so. 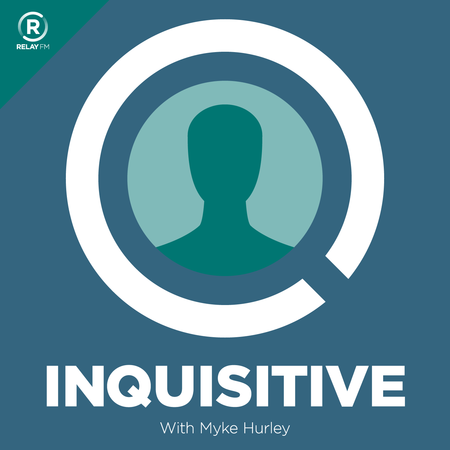 Inquisitive is an interview show hosted by Myke Hurley. The guests he has on are very interesting, ranging from developers to bloggers to podcasters to “thought leaders” in the Apple space, I guess you’d call them. Recent guests include Merlin Mann, Don McAllister, Shawn Blanc, and Tom Merritt. Myke’s interview style is friendly and laid back, and he creates a casual, compelling conversation with folks who do interesting things. Most modern podcasting apps have a function for speeding up the playback of the podcast. Overcast handles this in two ways. Smart Speed reduces the pauses between words, as I’ve written about previously. It also allows for the direct increase of the speed of the playback, and I run my podcasts at 1.5x-1.6x speed. I use both methods and find that any faster than 1.6x makes the sound a little too fast, not for my ability to understand, but to enjoy. If you’re finding yourself wanting to speed things up, I suggest increasing the speed in 10% increments.